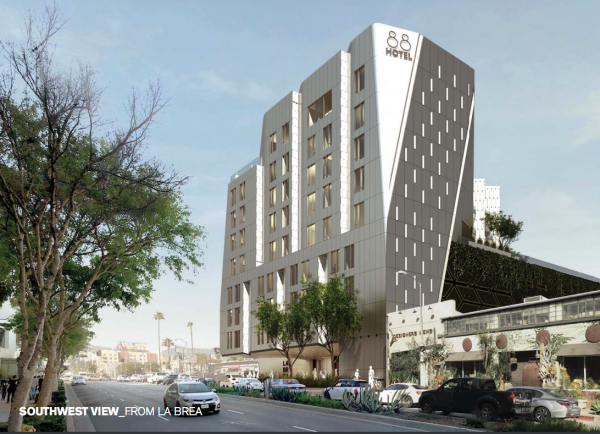 The nascent campaign to freeze construction of new hotels in West Hollywood for 24 months is evolving, with several changes made in the petition that residents will be asked to sign and former City Councilmember Steve Martin signing on as a supporter. The campaign has been initiated by Unite Here Local 11, the hotel and restaurant workers union. The goals of the initial petition, summarized by the City Attorney, were to “prohibit the city from accepting or processing applications for construction of new hotels, expansion of existing hotels or conversion of buildings into hotels during the term of the moratorium. A notice of the intent to circulate the petition cites a consultant’s report in 2015 that said the surge in new hotel rooms would have a negative impact for several years on existing hotels. The notice of intent says that sites for some of the proposed hotels could be used for multi-unit housing developments and cites the regional housing shortage. The request that the City of West Hollywood create a summary statement of the ordinance, which is required by law, includes a statement of intent to circulate a petition that is signed by Jorge Separak, a West Hollywood resident who works at the SLS Hotel in Beverly Hills; Riley O’Brien, a West Hollywood resident who describes himself as a housing advocate, and Steve Martin, a lawyer and former member of the West Hollywood City Council. All three also have signed the official statement in support of Measure B, an initiative by Unite Here to rescind the City Council’s approval of the Arts Club on Sunset Boulevard. Measure B will be on the March 5 city election ballot. It is too late to put the hotel moratorium on the March 5 ballot. In order to put it on the ballot for the November 2020 election, its backers will have to secure the signatures of 10% of West Hollywood registered voters. The union was able to get enough signatures to force the Arts Club rescission proposal on the March 2019 ballot but was unable to get enough to put on the November 2018 ballot a measure to rescind the City Council’s approval of the Robertson Lane hotel and shopping center project. Faring, the developer of the Robertson Lane project, mounted an aggressive campaign to convince local residents not to sign the union’s petition. It is unclear who, if anyone, will launch a similar campaign against the hotel moratorium proposal. The fact of the matter is that the City commissioned a study that reported back in 2017 that we were perilously close to having reached a saturation point due to so many hotel rooms that were in the process of being approved. The report appears to have been round filed even though existing hotels have expressed concern about the City’s irresponsible rubber stamping of all new hotel projects. We need to have more diversity in our local economy in order to be able to withstand a future recession as our municipal budget is overly reliant upon hotel occupancy tax. Rather than question the motives of Unite Here Local 11, we should be grateful that they are forcing a community discussion on an issue that is key to West Hollywood’s long term economic future. Applicable to West Hollywood and runaway hotel development, all the players are identified. Thanks to the union for shedding light on this imbalance. Just tell me where to go to sign this petition and I will gladly do so. I am sick and tired of our City Council trying to turn our community into Las Vegas. We have more than enough hotels already! We have more than enough traffic already! I used to be in a union, and enjoyed the benefits of that, but this union is one of the most shady I have ever experienced. They are extremely corrupt, and I hope their campaign fails. Here is my take on this. Unite here bullies the development to agree to unionize upon breaking ground. Should the developer not agree to unionize, Unite here attempt to (slander) stop the construction. Those who join this union should be notified their union dues (over $200K) was used to attempt to block the development of Robertson Lane Hotel, failed. Can someone explain to me why???? This article is missing a very important piece of information – the motivation and the justification of their need to stop hotel construction. Sure, the union provides a goal, a ridiculously bland statement for stopping construction. But that is not valid for their motivation. It’s a shake down. “Give us money or we will stop your development”. I don’t know the Union’s motive, but we have enough hotels here already. Sunset is turning into one big hotel row. The City is greedy. We need more housing, not more hotels. Why? Because we are over-building hotels, when we should be focusing on housing. I did not agree with the union’s stance and shady tactics on the Robertson Lane project. But in this case, I am in full agreement. And it’s a shame that this cannot be on the March ballot. I think it’s too late. We are over-building hotels. We are going to end up with too much supply, and not enough demand, and meanwhile, the cost of living here keeps going up and up and up, and no one is really seriously addressing the cost of living. Our elected officials seem to be more concerned with how much more money they can bring in from the transient occupancy tax. They think that building more hotels, just means more money for our government, which is not exactly going to improve the quality of life for residents. Upgrades to our park, night time shuttles, etc., are all great, but if you can’t afford to live here, who benefits from that? Rich people. And weekend visitors, and people living in neighboring communities. Lauren Meister is a notable exception here. She called for a study on hotel construction, and a moratorium.